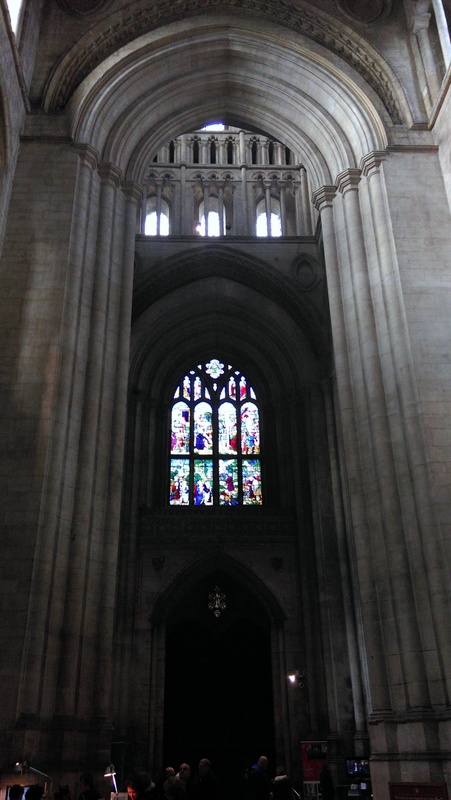 I feel somewhat ashamed to say, that until two weeks ago, I’d never visited Ely Cathedral, despite living less that two hours away. 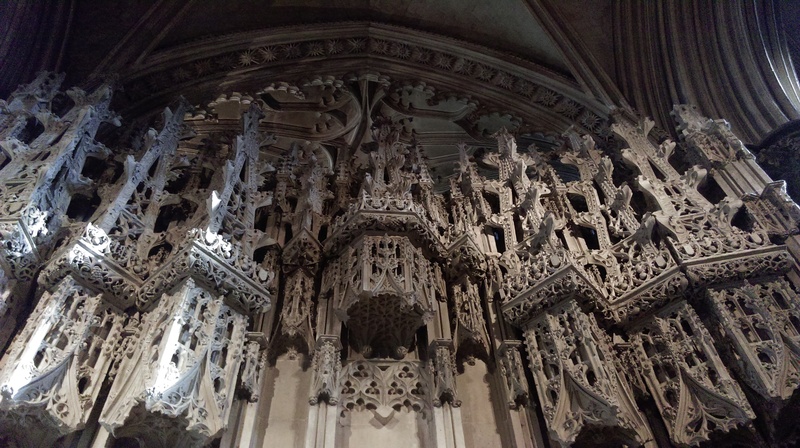 But now, having been, I’m certain I’ll be going back – possibly quite often, because even for a cathedral veteran like me, it rates very high in total gorgeousness. 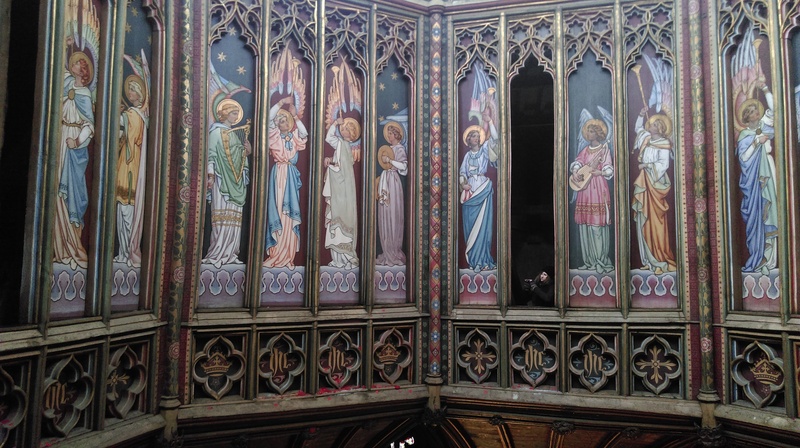 The reason for my visit, was to see the Royal School of Needlework’s exhibition of ecclesiastical embroidery, being held in the Lady Chapel. (Sadly, photography was not allowed in the Lady Chapel, so I don’t have any pictures from that part of the cathedral – which is a huge pity, because it is an extraordinary building, with one of the most impressive statues of the Virgin Mary I’ve ever seen, by David Wynne – Google it and see for yourself). 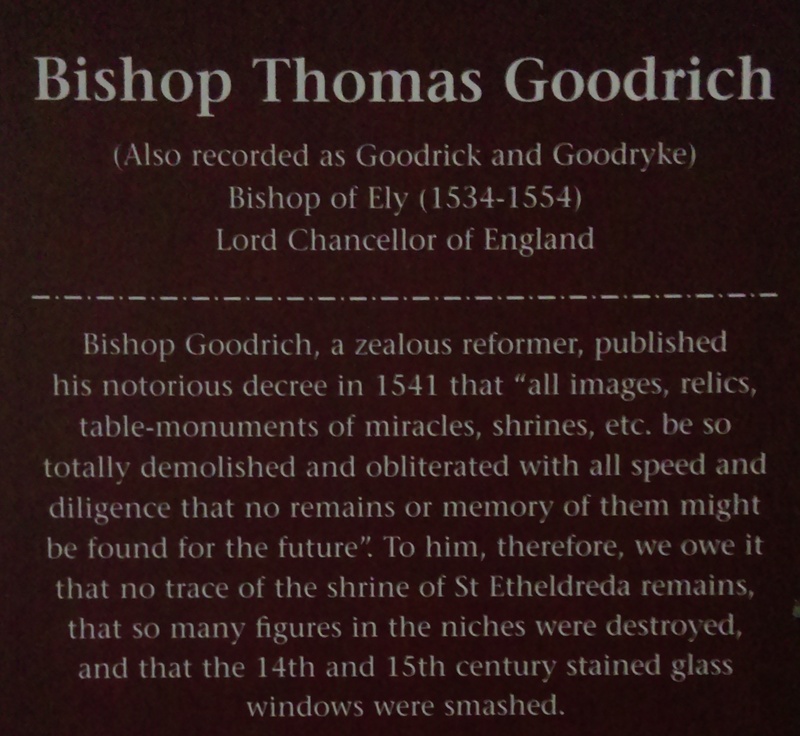 The other omission here is the Stained Glass museum, which was superb, but again, no photography. 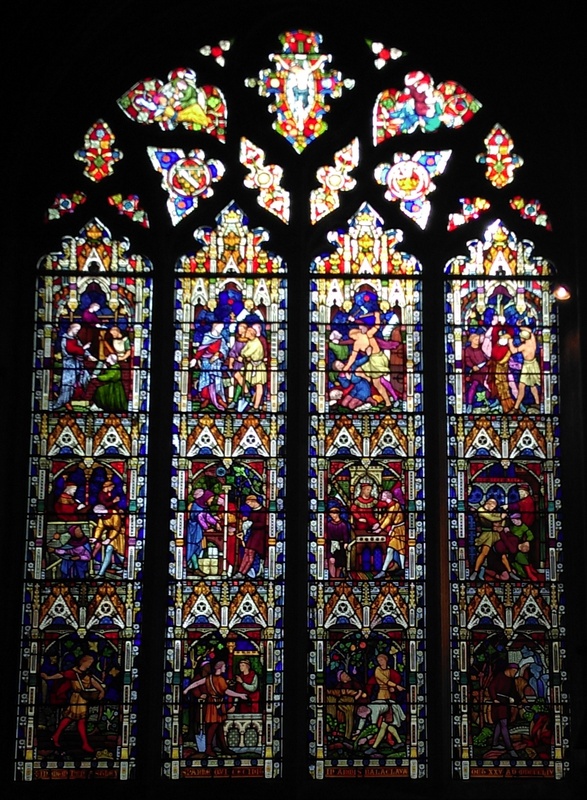 Throughout the cathedral, there are around a hundred stained glass windows which after being destroyed during the Reformation, were reinstated in the 19th and 20th centuries, helping to illustrate how the once decorated building of medieval times would have looked. 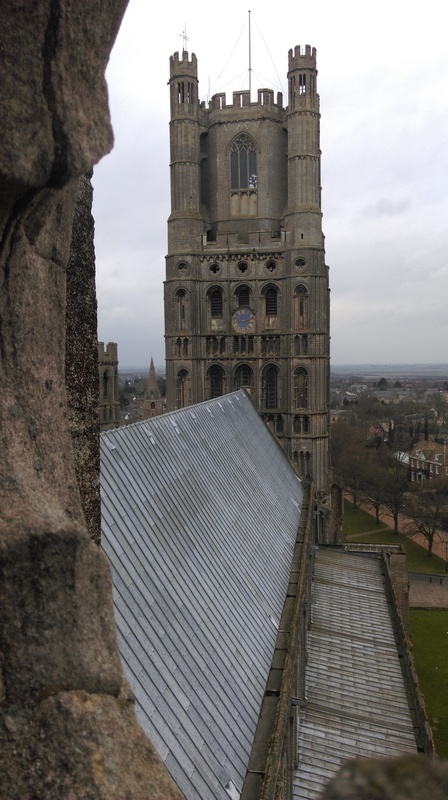 I was using my new smart phone to take pictures on the day I went, so there was some faffing about and not a few dodgy shots, especially of the stained glass, but what follows, are glimpses of Ely Cathedral on a cold and very windy February afternoon. 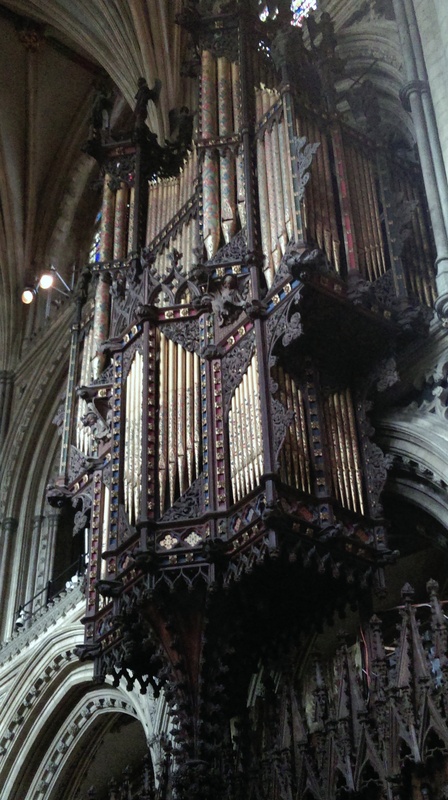 The organ is a Harrison & Harrison, with the case by George Gilbert Scott. Looking to the very top of the lantern. 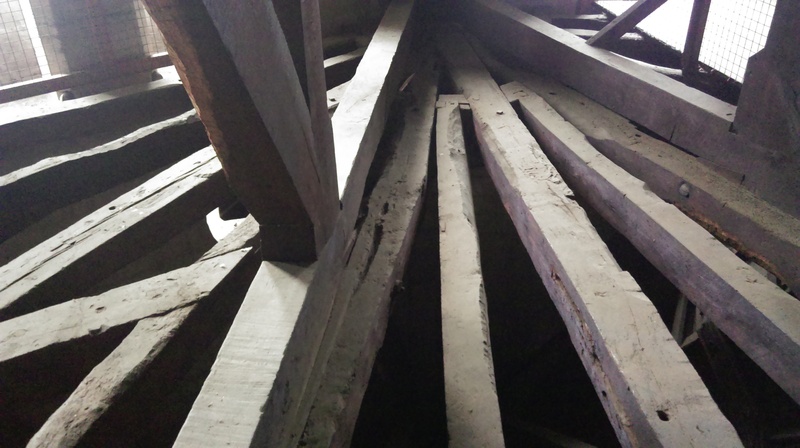 The timbers holding the lantern are around a thousand years old – the lantern was constructed in the 14th century, after the original Norman tower collapsed in 1322. 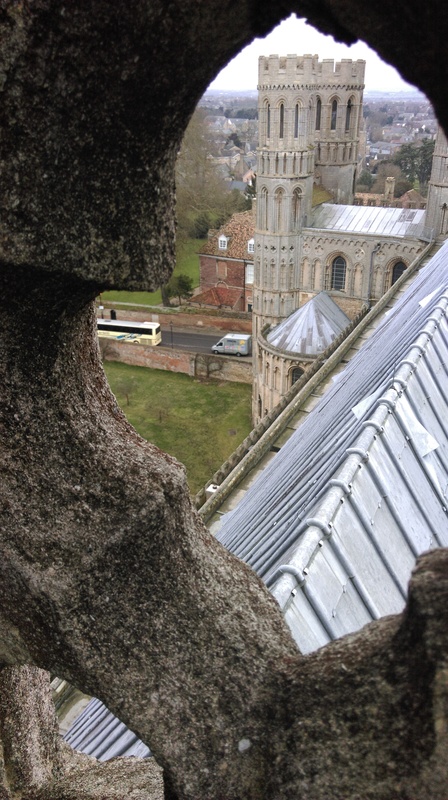 Looking down from the lantern – not for the feint-hearted. Outside – the lead covered wooden lantern tower. 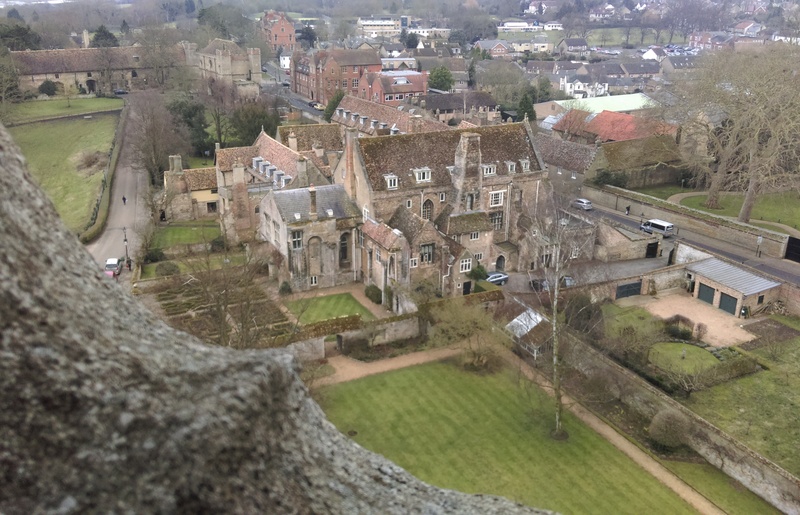 And looking out across the cathedral, and to the remains of the monastic buildings. 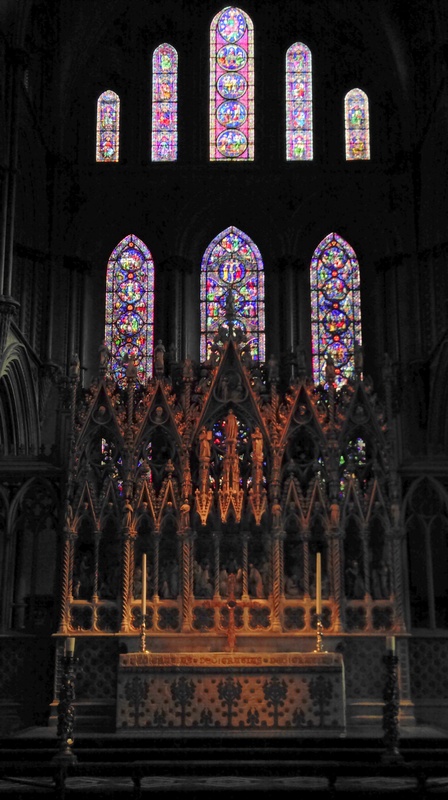 Ely Cathedral sits on the site of an Anglo-Saxon monastery. Nothing remains of the original foundation, but soon after the Norman Conquest, work began on the building which now stands tall and proud in the Cambridgeshire fen land. 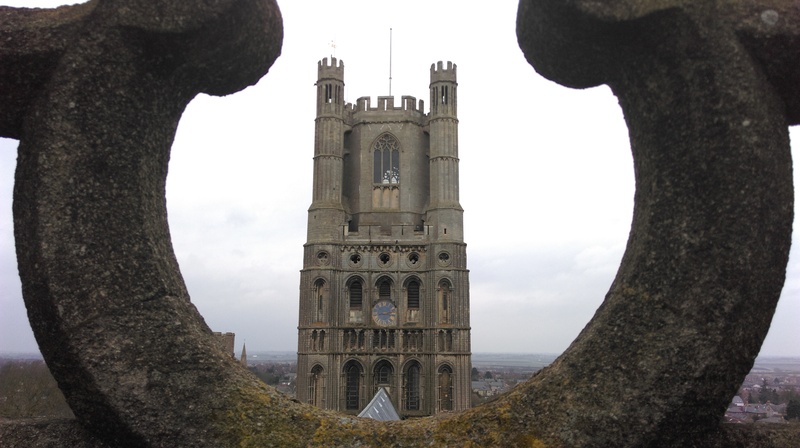 In 1322, the tower of the Norman building collapsed due to pillars being built on unstable ground, which resulted in the building of perhaps Ely’s most famous structure – the Octagon Tower and lantern. 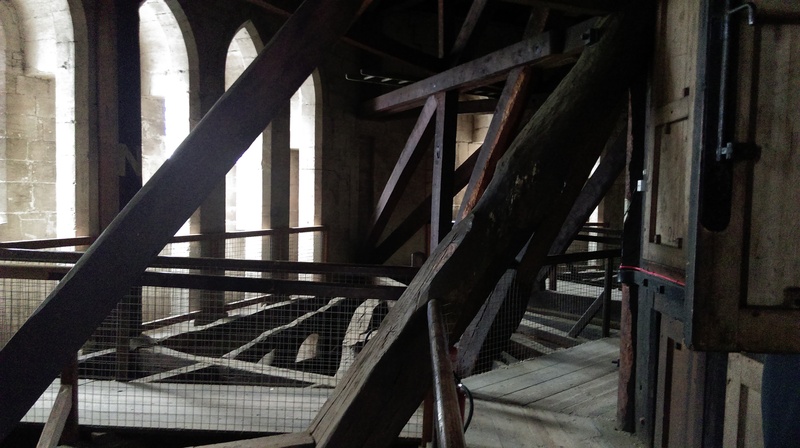 This is a remarkable wooden structure, which by spreading the weight across eight pillars avoids the earlier problem. 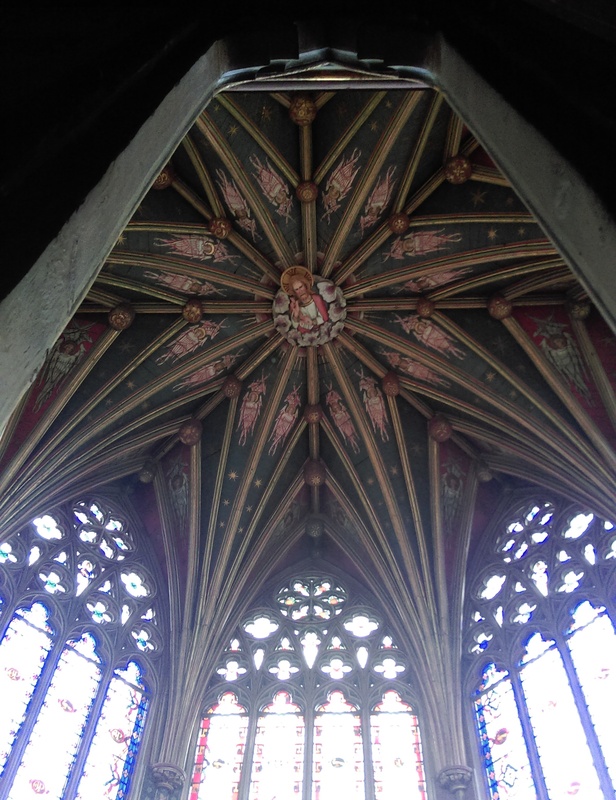 If you visit Ely, don’t miss the opportunity to go up to the lantern – there’s nothing quite like it – anywhere. And once you know that – you want to weep even more. 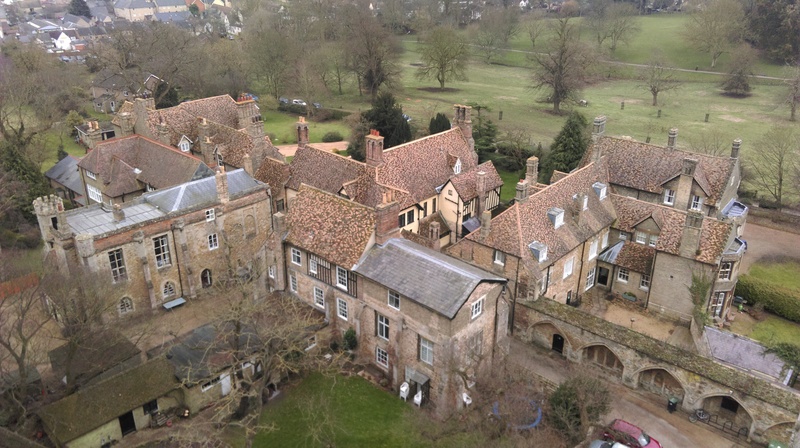 I’m hugely enjoying the Wolf Hall series on BBC TV at the moment, but remember, this wholesale destruction came about at that time and because of the political and religious events during Henry VIII’s reign. And then we hear about events now in the Middle East, and I wonder what has changed. 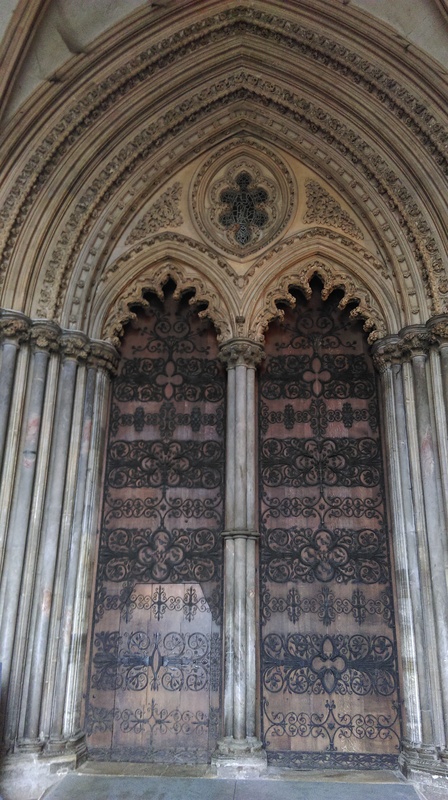 Immensely enjoyable…how could i have missed visiting Ely…but I did, so many thanks to you for showing me what i had missed. I did enjoy Bishop Thomas’s notice….well bred malice at work there! Oh I know – that’s exactly what I was thinking – and do you know, it was such an easy journey for me too. If I read it properly, the entrance ticket will allow me to go back for twelve months, so I’m planning to return just as soon as we get a slightly warmer few days. Stunning photos and fascinating history, Anny! 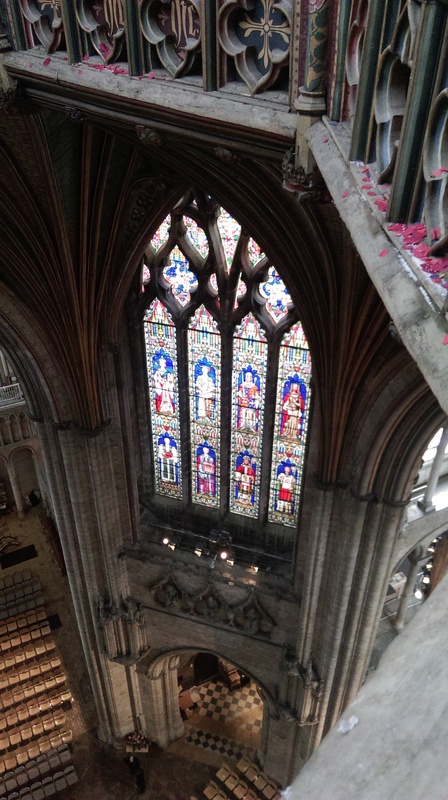 I knew very little about Ely Cathedral but it’s one of the cathedrals I would love to visit! Do put it on your ‘must see’ list, you won’t be disappointed. 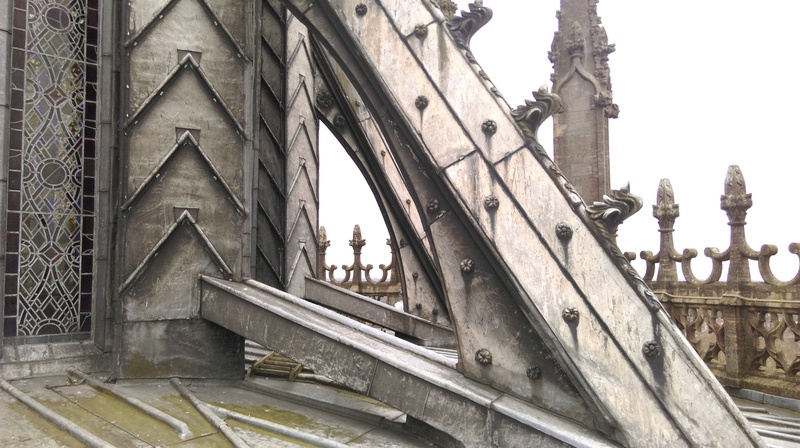 The shots I haven’t posted, were the ones taken with the phone held over the Octagon, looking down to the floor of the cathedral – I must have been shaking just too much and they’re a bit blurred – it’s a long way down! OOOh, goodness! I would have been shaking too! You were brave. 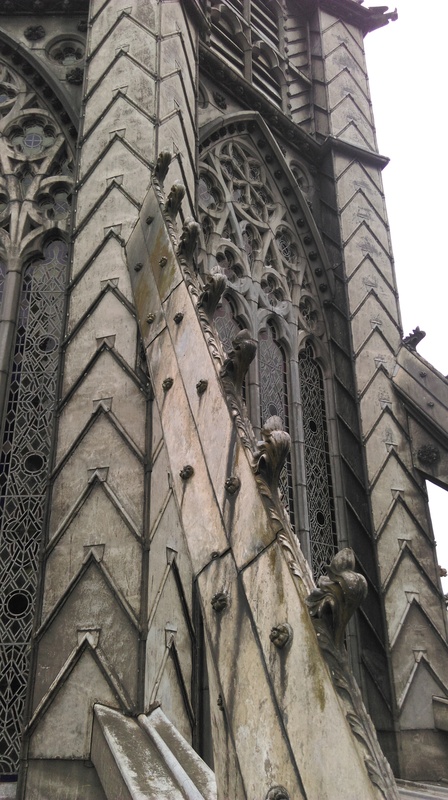 I’m sure I would have had to go up there, too!